Today’s Quito is a world-class metropolis with happy surprises tucked in so many corners. You wouldn’t know that, of course, if you’ve only flown in and out of its international airport. If your only experience of Quito is spending time stalled in traffic on your way out of the city, your opinion may not be high. But spend even a few days getting to know her and you’ll find that Quito is a very special place. Often called the “most beautiful big city in South America” due to its location in the palm of a valley cupped between towering Andean peaks, Quito has so many parks and plazas, it’s hard to pick a favorite. The 14,000-acre Parque Metropolitano, bordering the city’s Bellavista neighborhood, is the largest urban park in South America. (For comparison, New York’s Central Park is just 834 acres.) Hiking here, in the maze of forested paths, is a nature lover’s delight—the air smells of eucalyptus and pine, and from atop the eastern ridge, the views of Quito to the west, and to the east, the valley and volcanoes beyond is something you’ll not soon forget. 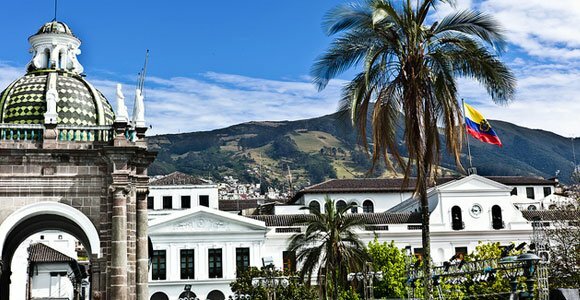 If you’re a city lover who likes to be at the center of the action then you’ll enjoy your retirement in Quito. When you retire in Quito, you’ll be close to the country’s best restaurants and malls. You’ll have access to many of the best entertainment, nightlife, and sporting events in the country. And nearly any need or want can be fulfilled without leaving the city proper. If you also like a rich culture, historic churches, beautiful architecture, and magnificent Andean views, then Quito and the surrounding areas could be the ideal place for you. The city runs roughly north and south in a valley between two ridges of mountains. Quito is a long and narrow city, so it’s not hard to navigate. And thanks to abundant taxi and bus services, and a light rail system called the MetrobusQ network, finding your way around the city is simple and affordable. These transportation options make it easy to explore the city’s many neighborhoods. With a population of around 2.6 million people, Quito is Ecuador’s second largest city (after Guayaquil) and is also the capital of the country. This means that nearly any service or amenity you could want is readily available. Life in Quito gives you easy access to administrative offices like international embassies and immigration offices. And the Mariscal Sucre International Airport is just a 45-minute drive from the city center, making travel back home easy and convenient. Modern and attentive medical care is readily available in the city with the presence of private hospitals, all manner of specialists, and SOLCA; the country’s premiere cancer treatment facility. Many of Quito’s physicians and specialists were trained overseas which makes for good odds of finding an English-speaking doctor. The city has also made a great effort to expand and improve their park system, making for plenty of green spaces mingled within the urban center. Parque Carolina is perhaps the city’s most celebrated park and is located near the financial district. It is made up over 160 acres with walking/jogging trails, sporting areas, botanical gardens, and even a Vivarium. Other parks include the massive Parque Metropolitano and Parque el Ejido, where you’ll find art and souvenir vendors, especially on weekends. Quito contains many nice neighborhoods with upscale condo buildings and easy walking access to restaurants, markets, and entertainment venues. A few of the more popular neighborhoods among expats include La Floresta, La Carolina, and La Paz. Each district boasts modern conveniences, but each is quite different from one another, so exploring the city thoroughly before settling down is highly recommended. If you like the thought of big city conveniences, but prefer a quieter existence, there are great options with Quito’s suburbs. A drive up and over the eastern ridge that surrounds the capital will drop you into one of the several valleys on the other side. Each has its own flair and distinct feel, giving retirees even more tailored options for relocation. Nayón is a quaint little agricultural town just five minutes out of Quito. Here you’ll find streets lined with plant nurseries and long-time residents gathered around the town’s main plaza. If small-town life with metropolitan conveniences within shouting distance appeals to you, Nayón could be worth a look. The towns of Cumbaya and Tumbaco are where you’ll find wealthy Quiteños living. These two towns are full of gated communities, golf courses and country clubs, and high-end shopping centers. You’ll also find a wide range of international expats, which means more varied dining options and a multi-cultural vibe. In Quito, you can enjoy a comfortable lifestyle. Quito is one of the world’s most affordable cities, where you can still take a taxi anywhere in town for $1.50 to $10 and find a menu del dia—usually a four-course meal of soup, salad, meat/rice/vegetables, dessert, and beverage—for $1.50 to $2.50. And certainly there are gourmet restaurants where you can spend much more but still not break the bank. 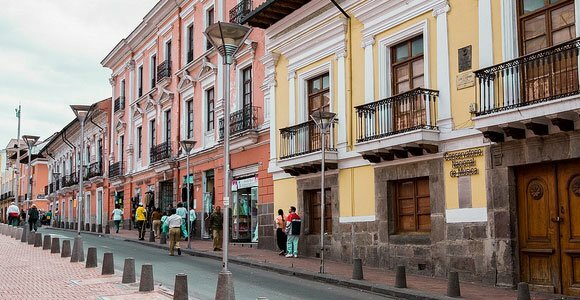 With Quito’s diversity and mix of all things modern along with a carefully preserved history you’ll never be bored. And you can live whatever kind of lifestyle you like. Even if you’re looking for high-end sophisticated living, Quito has got you covered. While you can spend as much money as you like, you don’t need to shell out the same amounts as you would for a similar lifestyle back in North America. There is no end of things to keep you occupied in Quito either. There are large shopping malls with clothing boutiques and even a Tiffany & Co. jewelry store. If you prefer buying from independent business people you can find street vendors and little artisan markets all throughout town. The city’s dozens of museums will also give you a chance to learn about Ecuador’s history and culture. 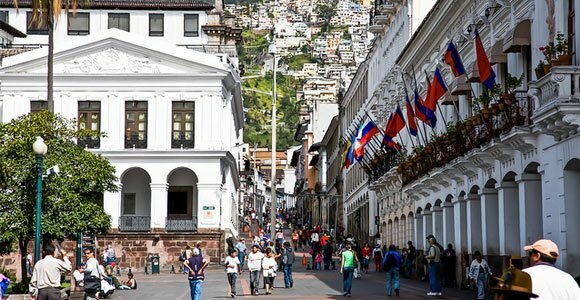 Quito has a notable population of expats from around the world, which means not only will you be exposed to Ecuadorian culture, but you’ll meet people from Europe, Asia, and other areas of Latin America too. A side benefit is that many restaurants specializing in international cuisine can be found throughout Quito. You can grab a shawarma on the go for $1.50, or treat yourself to chicken tikka masala and a glass of wine in a nice restaurant for $10. There is also great entertainment available as well. Symphonies, ballets, and art exhibitions are regular occurrences. Even big-name entertainers come to Quito from time to time. Admission for local events is almost always cheaper than that it would be in the U.S., and for some events it is even free of charge. Folks over age 65 only pay half-price for many of these events too. You won’t need to give up any of the conveniences from back home either. High-speed internet is commonplace in Quito, and with Skype and MagicJack it is easy to keep in touch with friends and family back home, without worrying about long-distance fees. Cable TV with English programming is available and you can even get packages that allow you to watch the NFL or other U.S. sports leagues. First-rate healthcare is inexpensive, too. Even at one of the best medical clinics in the city, you’ll never spend more than $50 for an office visit—and that’s with a top-notch, English-speaking specialist. And don’t worry about making friends. Ecuadorians are in general friendly, helpful people. Many business professionals who live in Quito speak English, so you won’t need to be fluent in Spanish to start making friends, though the more Spanish you learn, the more friends you’ll have available to you. Though smaller towns in Ecuador may offer more affordable housing, real estate in Quito is still reasonable. As a rule of thumb, you can expect to pay, on average, $85 to $120 per square foot for an older Quito apartment. Brand-new apartments will fetch more. As for rentals, depending on the neighborhood, size, and amenities of the property, and whether it’s furnished or not, expect to pay $400 to $1,500 a month long-term for a desirable location. Most of the desirable neighborhoods of Quito are located in the northern half of the city. You’ll find urban chic housing just minutes from shopping, dining, and outdoor activities in the La Carolina sector. El Mariscal is loaded with a wide variety of international restaurants and businesses that cater to tourists. On Avenida Gonzalez Saurez there are many condo buildings in quiet neighborhoods which appeal to many business professionals in the city. These aren’t the only neighborhoods worth looking into, but it is important to do your research before settling on a place to live. Quito offers many different facets and you’ll want to know which area suits you best. The good news is that Quito has something for nearly everyone and at reasonable costs. Here are a few examples of recently available real estate in Ecuador’s capital city. A 1,345-square-foot condo in the El Bosque area is being offered at $142,000. Here you’ll find two bedrooms with private bathrooms, a terrace, and parking for two vehicles. The condo is 10 years old and in a well-respected neighborhood. In the La Paz neighborhood on Quito’s east side there is an older yet well-maintained condo for sale at $245,000. The three-bedroom, four-bath dwelling has a total of 2,110 square feet. It includes a spacious kitchen and large windows that look out over the neighborhood and the nearby Iglesia La Paz. The building is secure and comes with two parking spaces and storage. If you choose to rent the property out you could yield over 6% annually. If you can’t afford to buy or you’d like to try Quito out before committing, take a look at one of the many rentals on offer within the city limits. In the La Carolina neighborhood a one-bedroom fully furnished and equipped apartment in a security building is renting for $600 per month. The location of this building provides access to a major shopping mall, the city’s largest grocery store, the beautiful Parque La Carolina, and a large sports stadium all within a five-minute walk. If you’re looking for a life of luxury, you can have that too. One expat couple is currently renting a 3,000-square-foot space in the Gonzalez Suarez area for $950 a month, plus condo association fees. The condo design is perfect for displaying their art collection on the many walls and in the alcoves and built-in nooks. At night the hillside location and row of large living room windows make it easy to watch the sparkling lights of Quito below. Remember that not only are sale prices negotiable, but rentals can be as well. It is important to look at a variety of options and do your homework. Have an idea of what similar properties are being sold for to make sure you’re getting the best value for your money. 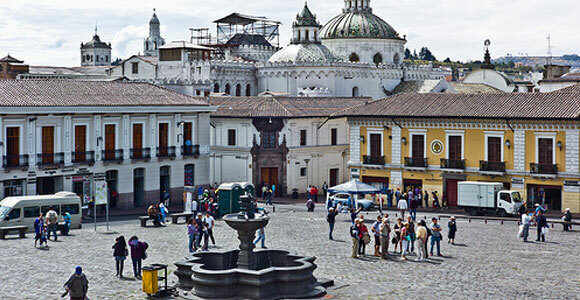 You can spend as much as you want in Quito, but most people live a comfortable lifestyle for $2,000 or less per month. And as most neighborhoods have restaurants, shops, and food markets you’ll save big on transportation costs when you shop local. If you buy your own house or condo upfront you’ll save on monthly rent payment, but even so, rentals can be quite affordable. A nicely furnished one-bedroom apartment in the Financial District can cost as little as $400 per month. It’s easy to save money on groceries as well. With so many fruits and vegetables grown in Ecuador the price of produce is low. And you’ll find better deals at local farmer’s markets than you’ll see in the chain grocery stores. You’ll spend much more if you must have name-brand products from North America, but if you can adapt to the Ecuadorian equivalents your grocery bill will shrink considerably. Eating out and entertainment is affordable as well. For example, dinner at a high-end Indian restaurant in the Mariscal District of Quito will cost less than two-thirds what it would at a similar establishment in Seattle. But many low budget options abound as well. A lunch complete with soup, salad, rice, potatoes, chicken, and juice can be had at any number of diners for $3. And you can find plenty or restaurants that fit somewhere between those two examples. Tickets for local arts events, such as Jazz concerts or exhibitions, are likely to cost $5 apiece. Entrance to a performance by the National Symphony of Ecuador could be had for $10 per person. If you opt to not own a car you can expect to pay $12 for a taxi ride from one end of the city to the other. City buses charge 25 cents per person and run anywhere you might want to go. Here is a sample budget for a couple living well in Quito. The expenses are approximate, but we’ve erred on the side of extra spending to come up with a budget that allows for a comfortable lifestyle for two people for $1,850 a month.